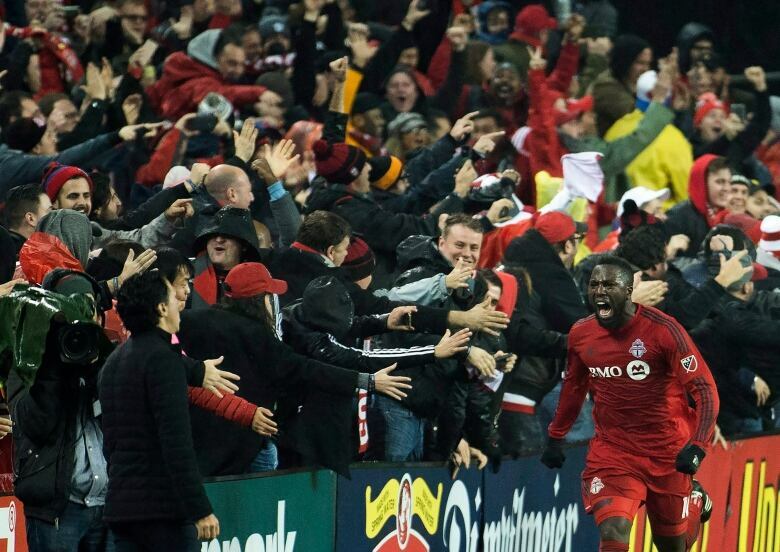 Toronto FC has advanced to the MLS Cup final. Benoit Cheyrou and Canadian Tosaint Ricketts both scored in extra time as Toronto beat the Montreal Impact 5-2 in the second leg of Major League Soccer's Eastern Conference final. In its 10th season, Toronto FC is one game away from celebrating the MLS championship. But Wednesday night at BMO Field in Toronto wiped out much of that misery. Substitutes Benoit Cheyrou and Tosaint Ricketts scored two minutes apart in extra time to send Toronto to the MLS Cup final with a 5-2 win on the night and a 7-5 aggregate victory over the Impact. "One of our messages was there was no way, no chance, no how we were going to be out-competed tonight in front of our fans in our stadium," said Vanney. "And we were going to run hard and we were going to run through everything that we had to make sure that those margins turned in our favour." Tied 5-5 on aggregate, Cheyrou scored on a header in the 98th minute, just one minute after entering the game, when he knocked in a Steven Beitashour cross. Then Jozy Altidore out-muscled a couple of defenders to send in a cross that Ricketts, beating two more defenders to the ball, swept in. "Guys are down in the dressing room. It's gruelling out there," said Impact coach Mauro Biello. "Today was a tough game, a lot of emotions in playoffs, it's a long season, and in the end the players gave everything, all the way to the end. It's a tough moment, for sure, for everyone, when you're so close and falling short. But we'll be back, and we'll be even stronger." In the Toronto dressing room, hip-hop blared. Canadian mid-fielder Jonathan Osorio clutched the Eastern Conference cup like it was his newborn baby.